Standing on the third tee at Princedale Country Club early one Sunday morning, I may as well have been stepping back in time. The quaint course, founded in 1928, sits on 70 acres of rolling farmland. Majestic pine trees cast long shadows on the gently sloping fairways. Peaceful ponds reflected the shimmering pink-and-purple hues of blooming trees. And, lo and behold, a faint rumbling sound echoed from the forest. I grabbed my camera, poked my head through a thin strand of trees bordering the tee box, and, sure enough, I was staring head-on at a freight train. This was pretty much a dream come true. Such magical moments are par for the courses in east Texas. Nine-hole layouts blend into the native topography. The tracts are as unpretentious as the folks who play them, and thus are a breeding ground for tales from the back nine. Back in the day, settlers were attracted to the piney woods because of the climate, abundant streams and wildlife. 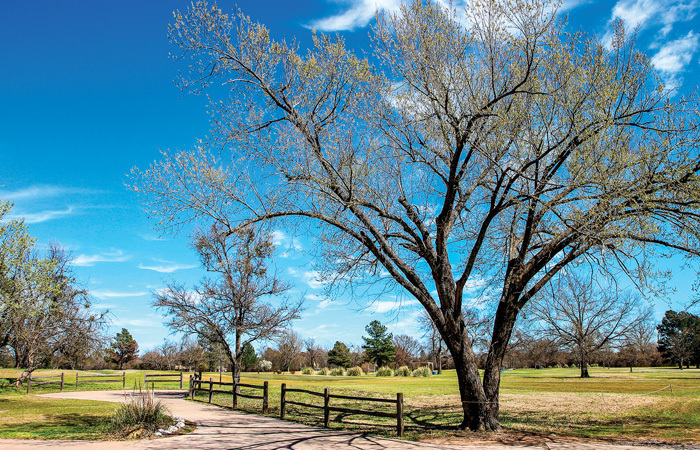 The development of lakes and parks, and the revitalization of charming historical towns has magnified the appeal, making East Texas a haven for wilderness golf adventures. On the twisting farm roads, you will see cars parked on the shoulder and people fishing for bass beneath a bridge, or bird watching, or buying fresh fruit from a local vendor. 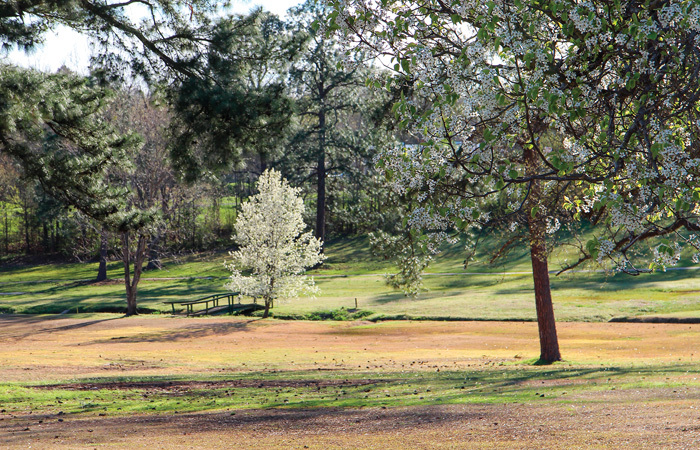 The far north section of the region – the corridor between SH-30 to the north and I-20 to the south – features nine state parks and some 24 golf courses. Trails I forged on previous journeys to the Panhandle, Big Bend, and Oklahoma put considerable mileage on the ole F-150, which, by the way, has held strong since undergoing an emergency alternator transplant in the middle of nowhere. Upon seeing our piney woods itinerary, the beast headed east with a grin on its grill. Never mind that his bed was loaded with the usual assortment of golf, camping, and fishing gear – topped with firewood. With so many golf courses and state parks bunched together, the old lug acted as if he were on vacation. We would simply connect the dots after hitting I-30, or so he thought, in search of courses off the beaten path. We also had the luxury of extra daylight. No more 6 p.m. winter blackouts, which meant more time to dawdle before setting tent. Plus, the landscapes were starting to pop with color and the bass were starting to spawn. After crossing Lake Ray Hubbard, the courses came at us quickly. I resisted the urge to revisit previous haunts Stone River CC in Royse City and McQuinney Howell Wright Park Municipal in Greenville. Sand Hills Golf and Country Club in Campbell was the perfect starting point. Arriving on a sunny afternoon with wispy clouds in the blue sky, I was greeted on the porch by a friendly chocolate lab. A quick tour of the clubhouse revealed a cozy bar, pool table, and darts. The walls were adorned with scores of old photos. There’s a screened party room, an outdoor patio with a covered dance floor, as well as a fire pit and smoker. Keep walking and you’ll be on someone’s ranch. The course, founded and designed by its 10 members in 1962, epitomizes the nine-hole experience. Nestled on farmland, the layout is not perfectly groomed but the club works hard to maintain good playing conditions. You can hit every club in the bag, and the towering trees will test your accuracy. The club recently redid three greens (2, 3, 7) and added a fleet of golf carts. To keep things fun, Sand Hills’ calendar is stocked with tournaments, cookouts, music and pool parties. On Tuesdays, $21 will get you a round of golf with cart, hamburger and chips. After a one-hour drive down SH-19, one of the original 26 Texas state highways proposed in 1917, and a few stops for pictures,I pulled into Mineola Country Club about 5 p.m. The course is located across the street from the Mineola Nature Trail. A couple of wrong turns and I was practically on the runway of Mineola-Wisener Field. Just like the highway that got me here, the airport was established in 1917. It’s the oldest privately owned, public airport in Texas. So, there’s that. Mineola Country Club is one of the state’s best nine-hole layouts. The semi-private, nine-hole course, designed by the founding members in 1932, boasts remarkable vistas. The sloping terrain adds to the shot-making challenges. Majestic pines, Texas redbuds and dogwoods border the fairways. The blooming trees cast shades of purple, pink and white in the late afternoon sun. A series of bridges cross a small stream that meanders throughout the course. The rolling landscape, twisting doglegs, and foliage provided an Augusta National vibe. Small fast greens with runoffs keep players honest. The pro shop has a bunch of historical items on display, including ancient head covers and golf balls. The clubhouse features shuffle board and pool, and Kelly B’s Main Course Restaurant/Bar. Having lingered at Mineola, I realized that if I didn’t hurry, I would once again be setting tent in the dark. So predictable. Complicating matters: It was spring break, so the parks were mostly booked. I accepted this as a challenge, grabbed a cup of coffee for myself and a whisky for the beast, and we chugged down SH-37. for some unknown reason in Oklahoma, I all but obeyed speed limits. Dusk and a series of doglegged farm roads dashed our hopes of arriving in daylight, but that disappointment was erased by the gorgeous sunset that painted Lake Cypress Springs orange. Arriving at about 8 p.m. with no reservation was no problem because, well, we were in Texas. Not only did the TPWD ranger have a primitive camping spot available, but it was a corner lot. Could I fish at night? Yep. In fact, it was elbow-to-elbow on the lighted pier – a virtual crappie hour since the bass spawn was delayed by the cool water temperatures. Tent setup, orchestrated with a flashlight dangling between my teeth, proved typically disastrous. A breeze made the low 40 degrees feel like 30 something. I got the fire going quickly, but construction of my sleeping quarters became comically chaotic. Long story short: Not even duct tape would repair a torn panel of the tent. Short story long: I finally threw two tarps over the tent and hoped for the best. I awoke about 3 a.m. The tarps were down. My sleeping bag was the only protection I had from the cold wind. Hypothermia for breakfast anyone? Hey, at least I was up early, and Princedale Country Club was only 13 miles away. Princedale has everything you want in a country course. The scenic values are similar to Mineola. Towering pines border many of the fairways, dogwoods and redwoods add color to the sloping landscape, and small crowned greens complicate shotmaking. The nine-hole layout measures only 2,900 yards and features only one par-3 (No. 6, 147 yards) and one par-5 (No. 8, 435 yards). But Princedale has two qualities that few other courses can match: It’s 91 years old and a train runs through it. You could hop that train to Daingerfield, which is just 15 miles away on SH-11. Daingerfield Country Club, formerly Beaver Brook. The semi-private course has undergone a few cosmetic changes, and looks significantly better than when I visited six years ago. The clubhouse sits atop a large hill overlooking expansive fairways dotted with massive oaks and recently planted pines. The stream virtually dissects the layout into three sections. The fishing mecca of Lake Fork is 63 miles from Daingerfield on scenic SH-11. You know you’re getting close when the convenience stores have minnows, worms and other live bait for sale. Lake Fork Golf Club sits on the west bank and the Links at Land’s End on the east. 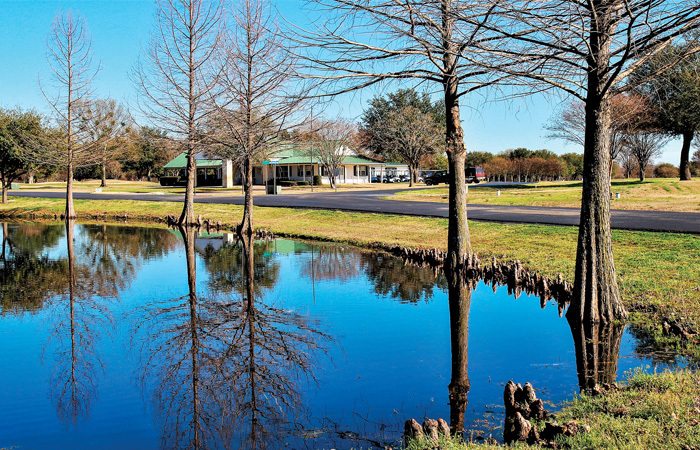 Lake Fork GC, an 18-hole layout measuring 6,017 yards, boasts some 2,500 trees. The course has worked hard to bolster its status since opening in 1998, earning “Most Improved Course in East Texas” by the East Texas Golf Association. The Links at Land’s End may be the ultimate buddy trip location with lodges inside the gated community. The resort occupies a peninsula on the country’s finest trophy bass fishing lake. The golf course has also drawn rave reviews. The 12 holes in which water comes into play are big on wow factor with spectacular views of the lake. New ownership, which took over in 2016, has made improvements, including new white sand bunkers. As I headed back to Lake Bob Sandlin State Park, the sun was setting in my rearview mirror. I wondered what the sunset might look like from the pavilion at the Links at Land’s End. But I had no regrets. The spring break crowd was gone, the lighted fishing pier was deserted, and with fasteners purchased at a convenience store, I easily repaired my tattered tent.